The Nancy Shepherd House Inn Bed and Breakfast in Old Town Winchester VA, now a fully licensed historic hotel, is one of several early federal period inns that once lined the streets of downtown Winchester, Virginia. It is now, once again, available for events and overnight guest accommodations. 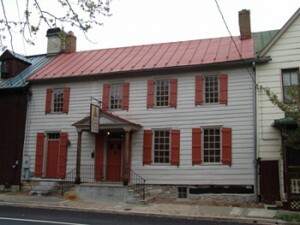 The Nancy Shepherd House Inn is a rare surviving example of an early Old Town Winchester tavern & inn, currently in operation as a B&B. It is right downtown in Winchester’s historic district, with quaint shops, gourmet coffee houses, pubs, and fine restaurants all within easy walking distance. If you would like to stay right in Old Town Winchester, consider the Nancy Shepherd House Inn!